Frances Scribner was born in Berlin, New Hampshire on May 23, 1920, the daughter of Rose Brisson and Leroy Scribner. She entered the Marist Missionary Sisters on August 2nd, 1941 and was professed in Bedford, Massachusetts on August 15th, 1944. Shortly after profession, Fran (who was known then as Sr Mary Benjamin) suffered bouts with colitis and nervousness, followed by orthopedic symptoms in shoulder and arm. Back pain due to disc lesions between vertebrae became chronic and anxiety plagued her. Fran made up her mind early in life that she was destined to have the cross of suffering, so she learned to push herself through the pain and immerse herself in work. 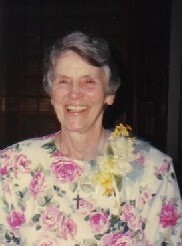 After doing various community services – kitchen, sewing and music – in Bedford and Framingham, she was sent to Hawaii in September 1953, where she served as the local superior of the SMSM community first at Star of the Sea parish in Honolulu, then at St Stephen’s Seminary in Kaneohe. In 1960 Fran’s recall from Hawaii to Framingham for health reasons, was so traumatic that it brought on depression. Fran was suffering great emotional and physical stress and wrote of this to Mother M. Cyr. She didn’t know what would become of her: she needed to leave Hawaii but couldn’t face leaving a failure. What would this mean to her great desire to be a missionary? She didn’t know what she wanted, only to be real and to have an end to problems and to pain. The next few years, she gave of herself generously in a variety of community services while entering into counseling. She was assigned to Jamaica briefly in 1965, but returned and began studies at Assumption College in 1966 and graduated in 1970. In 1973 Fran requested a one year leave of absence to have the time and space to discern her vocation. At the end of the year, she asked to return to Community as she missed community and was unable to live her Marist vocation on her own: She loved her Marist vocation. In 1977, Fran made an SMSM Long Term Spiritual Renewal in Coogie Beach, Australia. That renewal, coupled with her Masters degree in Psychology and an incredible psychological healing gave her a new lease on life. Fran began a full-time counseling practice in Framingham and continued until terminating her last client when she was 90 years old. Fran’s story is that of a wounded healer searching for her own cause of emotional distress and experiencing torment in her body in a multitude of ways. Fran was often misunderstood and hurt, as so often happens to those with such struggles, until finally receiving healing of mind body and spirit. Her Cross, darkness and agony would find consolation in that of Jesus and Mary. She was able to use her sufferings to touch the sufferings in others and to become a light leading them out of darkness. Her mission would be Framingham and especially accompanying the growing Marian Lay Community. Thank you for being a beacon of light, a frail human with a great capacity to be strong. We will remember a loving woman with an ever-ready smile, listening ear and a will of steel. We ask you to pray for us and to smile on us. Let us take hope from your life of courage and trust in God’s healing love.